Wearing a purple Manika Nanda midi, Rakul promoted her upcoming movie. Statement earrings and a pair of metallic earrings were her accessories of choice. Think she fared well? While at an event launching a song from her upcoming movie, Sonakshi was photographed in a Manika Nanda suit. Wearing her hair back, she finished out the look with matching red lip color and pair of Christian Louboutin pumps. The head-to-toe red is a lot to take in but oddly, it worked for Ms. Sinha. At the launch of a beauty store in Mumbai, Bipasha was seen in a Manika Nanda dress that showed off plenty of décollete. Drawing further attention to it was the Zara lariat necklace. Hair in a sleek ponytail, a bold red lip and mirrored pumps finished out her look. The bronzer did feel a bit heavy handed but overall she looked good. Well, I liked. Did you? Wearing a Manika Nanda dress, Richa attended a recent movie screening in Mumbai. A strong red lip, Nasty Gal chain-strap bag and pair of Christian Louboutin spiked pumps rounded out the actor’s look. Love the pumps, the dress, not so much! 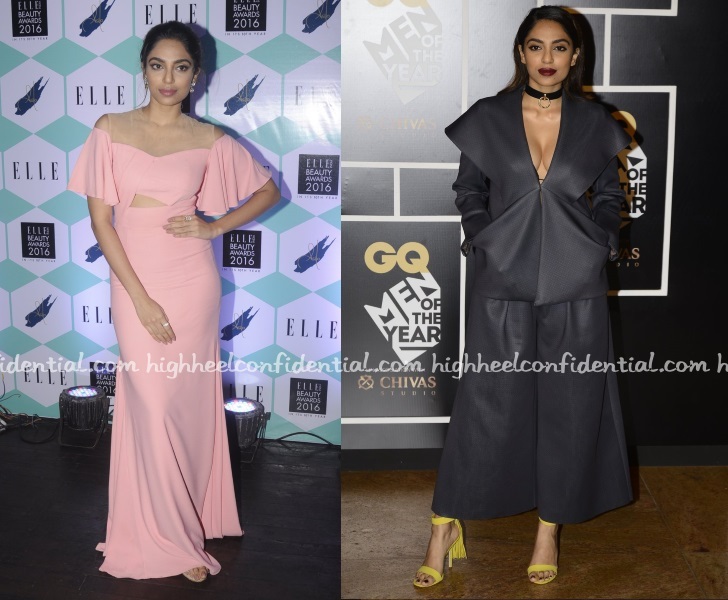 Sobhita attended two awards events recently sporting two completely different looks. The GQ Men Of The Year Awards saw the actor in a Dolly J suit paired with a dark lip and yellow Aldo sandals. At the Elle Beauty Awards, it was a pale pink Manika Nanda gown. I’ll admit when I first saw the suit look, I wasn’t quite loving it. But, after the Elle Beauty appearance, the former outfit looked a lot more interesting. Something about the gown look just felt a bit meh. A bit lackluster. Which look did you prefer?